SAINT LOUIS, Missouri — Where does generosity come from? At Forsyth School, the answer is easy—the second grade. A bulletin board highlights countries where animals are donated and features photos of students who have donated their own money. Some forgo birthday or holiday gifts and others chip in allowance cash. “Because every donation helps, we stress that no gift is too small,” said teacher Eric Axelbaum. “Additionally we work together on an activity or project to help strengthen our sense of community and reinforce our class values.” Every school year starts with the reading of Beatrice’s Goat, he said, to help the students understand how many people in the world have very different lives than they do. On special Fridays, surprised neighbors and the entire school might look outside to find every second grader and all four teachers—Becca Meddler, Liz Alessi, Jill Dorgan and Axelbaum—dressed in western wear, line-dancing on the playground in a “Heifer Hoedown Extravaganza.” On every other Friday morning, they wear team T-shirts to the Heifer Hoedowns for team updates on fundraising totals, to honor individual donors, to decide what animals to buy and to learn more about Heifer’s projects through videos and literature. Going back more than 10 years, the second graders donated one goat a year for a family in need overseas from a can-crushing project. Yet since 2008, under the project leadership of teacher Axelbaum, the classes have donated thousands of dollars to send animals and training to those in need. Students still crush and recycle cans but also make jewelry for sale. Teachers include lessons about poverty and agriculture in the curriculum, with students learning about the animals, how much milk they produce, the number of offspring and other vital characteristics. Based on this information, they vote on their favorites. Goats and water buffalo are always at the top of the list, as is the milk menagerie when students raise more than $1,000, Axelbaum said. Heifer’s President and CEO Pierre Ferrari, in a recent visit to St. Louis, was able to stop in and join in the spirit of giving at the school. Axelbaum said it’s meaningful for him and his colleagues to teach kids that they need to do something to help less fortunate people instead of just get their parents to donate money for them. “The children collect, rinse and crush one can at a time. They forsake gifts to help others. Finally, they personally make one piece of jewelry at a time. This is the most rewarding part. Will: I like raising money and giving animals to people who are less fortunate. Jordan: It is helping save people’s lives. Emma: I like how when we donate money, it allows us to pass on the gift. Owen: When we donate, we get our picture on the wall, and it lets us know that you are saving lives. Nicolas: If we didn’t help, there would be a lot of poor people out there who wouldn’t have food. Sylvia: I like making the can-tab jewelry, which helps raise money for Heifer. What would you like to give kids your age who are hungry or don’t have a safe place to live? Madeline: I would like to give them animals who produce milk. Then they could sell the milk. Peter: I would want to give them five pigs, two water buffalo, and one goat because the goat would give a lot of milk, pigs would be sold to make money, and the buffalo would pull carts. Grace: I would like to give them a great family and a nice, warm house. Olivia: I would give them a goat like Beatrice because goats give off babies and also make milk. Maggie: I would give them a nice shelter. The nursery school students at the La Jolla United Methodist Church started a garden and farmers market after hearing the story of Beatrice’s Goat. 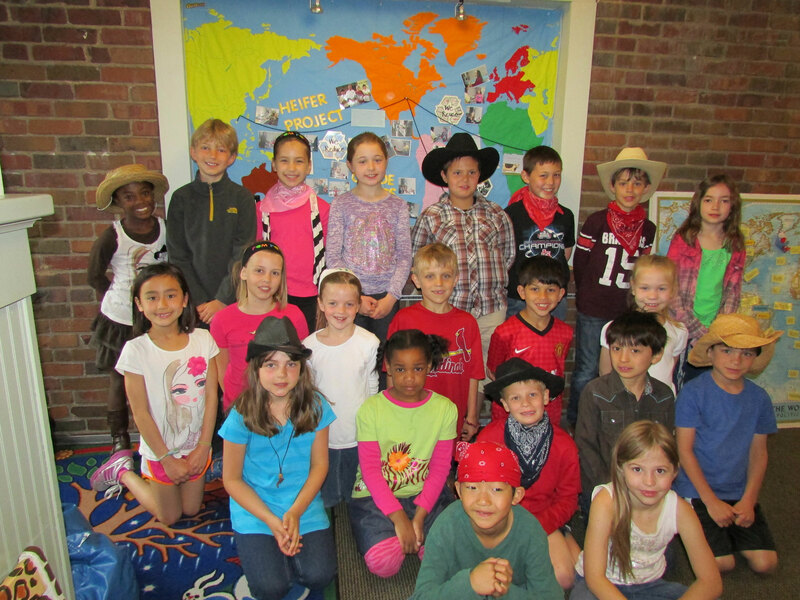 The children help plant, tend and harvest the garden and send all market proceeds to Heifer International. LA JOLLA, Calif.—Digging for worms, picking (and sometimes eating) blueberries and holding baby chicks may sound like fun for many children, but it’s a job taken very seriously by the nursery school students at the La Jolla United Methodist Church. And they do it all to help others. Part of the teachings at the church’s “Yellow Cottage” class is giving back. Preschoolers used to come to school with money they had earned from home, and the class would then take a trip to the local store and purchase food to donate to the Christian Charities, said teacher Kim Schwartz. But two years ago a student proposed the idea that they grow their own food for people to eat instead of buying food for the charity. The next day, the children went to an empty lot on the church property and began their preparations for a garden plot, Schwartz said. One boy in the class brought with him a gardening book that showed children growing foods. He encouraged the others to be help like the kids in the book, Schwartz said. The class also had help from a troop of Daisy Girl Scouts and their parents who built raised garden beds and from an Eagle Scout who put in an irrigation system. Though the children had good intentions with the garden from the outset, Schwartz said the idea to sell produce to raise money for Heifer came after the children were read the story of Beatrice’s Goat. They were inspired by the story of a girl who received a goat from Heifer, Schwartz said. Three nursery school students check over their harvest while setting up for a market Friday. “It was the children’s hope from the time we read the book Beatrice’s Goat to send a goat but we did not make enough with our first sale so they purchased chickens and ducks and saved what was left to add to the next week’s donations. Eventually they did send a goat and some other animals,” she said. The Yellow Cottage class holds its market each Friday afternoon from 1:45 to 2:15, in the community garden adjacent to the La Jolla United Methodist Church. The students, parents, church members and other volunteers tend the garden daily, Schwartz said. The garden includes fruit trees and seasonal vegetables: tomatoes in the summer and winter wheat and buckwheat in the fall. The nursery school also has chickens and ducks. “The prize is gathering the eggs,” Schwartz said. The garden is in its second year of production. So far the nursery school children have raised nearly $1,200 with no sign of turning back. The children’s reactions to seeing the money they earn go to hungry people around the world has varied, Schwartz said. But mostly, she thinks the kids take pride in their good deeds. What is your favorite part of helping work in the garden? Eden Toppi, age 5: Planting sunflowers. Maya Hanoch, age 5: Seeing the chickens in the garden. Inji Hamdoun, age 5: Digging for worms and holding chickens. What is your favorite thing to eat from the garden? Maya: The tops of the radishes. Inji: When I go into the garden I like to pick and eat blueberries. How often do you get to help in the garden? Inji: A few times a week. We take care of the chickens on the weekends. What do you know about Heifer International? What is your favorite part about Heifer? Eden: They buy goats for families. My favorite part is rabbits. Maya: They sell animals to people. Selling the animals. Inji: They give farm animals and plants to people around the world who don’t have much. They teach people how to keep their animals healthy. Do you want to keep donating to Heifer as you grow up? Why? Eden: Yes, because I like to do it. Maya: Yes, because I like to give people animals. Inji: Yes! I had a lemonade stand this summer on my street and I raised $17.55 to donate to Heifer. I told people I was donating the money to buy animals.